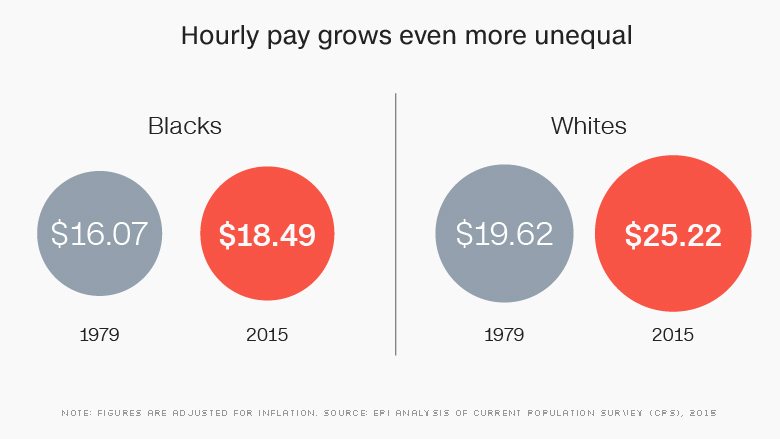 The wage gap between blacks and whites is the worst it's been in nearly four decades, according to a new report from the Economic Policy Institute. What's driving the wage gap has little to do with access to education, disparities in work experience or where someone lives, EPI found. Rather, the researchers found "discrimination...and growing earnings inequality in general," to be the primary factors at play. "Race is not a skill or characteristic that should have any market value as it relates to your wages, but it does," said Valerie Wilson, the director of the program on Race, Ethnicity and the Economy at the EPI and a co-author of the report. Studies have shown that applicants with "black sounding names" like Jamal are less likely to get a call back than applicants with names that appear white. Wilson also cited the skyrocketing incarceration rates of thousands of black men and women in the 1980s and 1990s who were pulled out of the workforce and have since struggled to get back in. Wage inequities also build up over time, Wilson said. If a black person started working in the 1980s and earned less than a white person, then "that disadvantage carries over." The researchers found that in 2015 the wage gap between black men with 11 to 20 years of work experience and their white counterparts was wider (23.5%) than it was for black men who had 10 years' of experience or less and their white peers (18.7%). Black women with 11 to 20 years of experience were paid 12.6% less than white women with the same experience and those with 10 years' experience or less made 10.8% less. In an effort to combat this type of wage disparity, Massachusetts lawmakers recently passed a bill barring employers from asking about an applicant's previous salary. On a national level, the Obama administration announced a proposal in February to track wage data by gender and race for public companies and federal contractors that employ 100 employees or more to help "deliver on the promise of equal pay." Attaining a higher education also failed to close the gap between black and white workers, the report found. Black men with a bachelor's degree or more and who had 11 to 20 years of work experience made 27.2% less than whites with the same level of education and experience. Black women with a bachelor's degree or more and 11 to 20 years of work experience were paid 10.6% less than white women. Recent college graduates with less than ten years of work experience also saw gaps in earnings by race. Black women with a bachelor's degree alone were paid 10.7% less than white women, while black men with the same credentials were paid 18% less than their white counterparts. 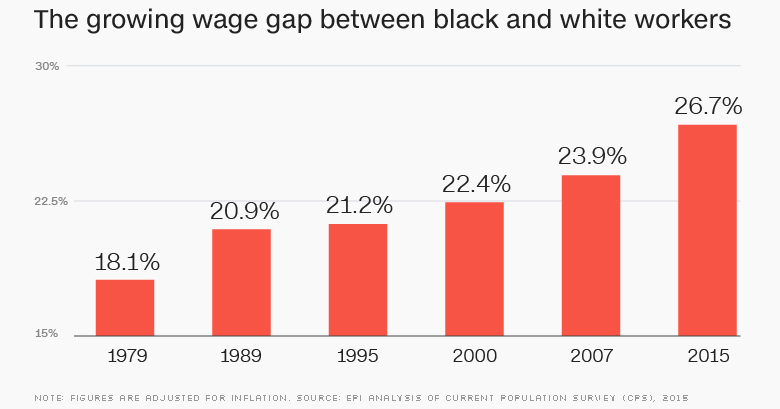 The wage gap between blacks and whites has ebbed and flowed over the past four decades. In the 1980s, Wilson said a combination of factors including a stagnant minimum wage (the federal minimum wage was $3.35 an hour between 1981 and 1989), a tough post-recession job market, declining participation in unions and the easing of enforcement on policies, like affirmative action, expanded the gap. In the 1990s, things started to shift. The minimum wage increased from $3.80 in 1990 to $5.15 in 1997 and there were more jobs and more political support for the enforcement of anti-discrimination laws. 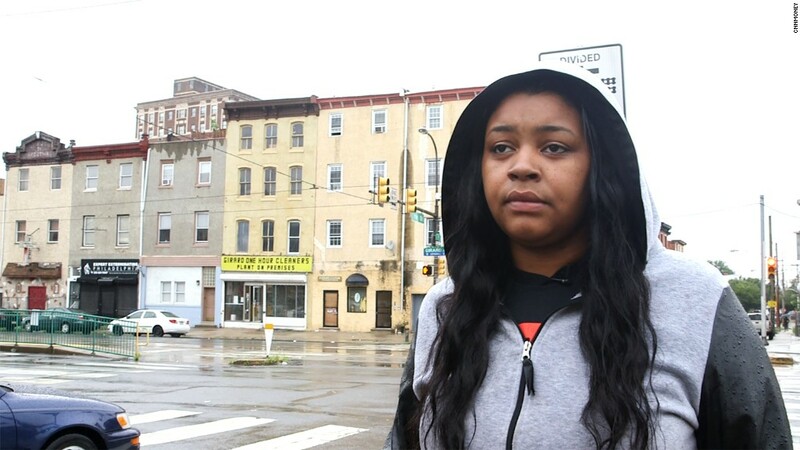 "The balance of power shifted to the workers," she said. "People were eager to hire people. Back then almost everyone had a job," she said. But by 2000, the wage gap started growing again. From 2000 to 2007, the gap between whites and black wages increased by 6.3% to 23.9%, driven mostly by stagnant wages, unemployment and slow economic growth, Wilson said. And from 2007, the start of the Great Recession, to 2015 it grew by 10.5%. Long term, the racial wage gap will ultimately result in less consumer spending, increased poverty and more strain on social safety net programs Wilson said. It can also affect the way people see the American Dream. "You're supposed to come to this country, work hard and do what you need to do to get ahead, but everybody doesn't face that reality."